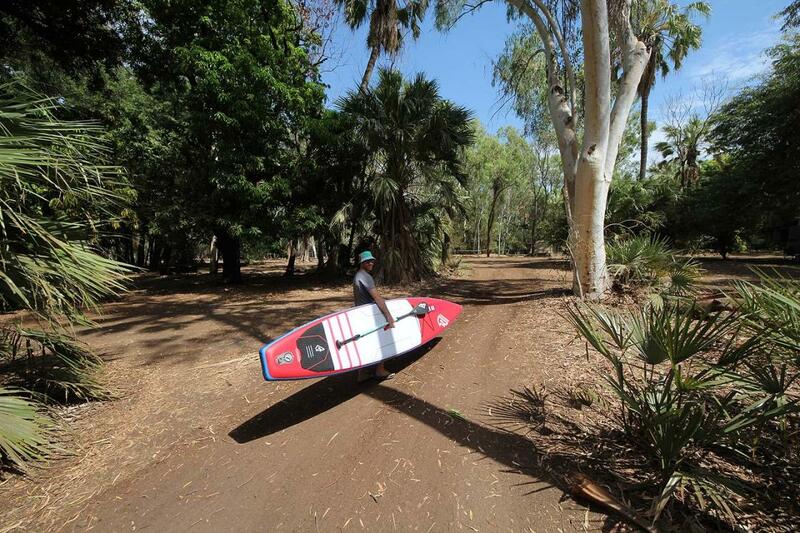 Adels Grove was a perfect location for us to explore the amazing Lawn Hill Creek using an inflatable SUP provided by Fanatic. It wasn't long before we had fellow campers gathering around to try out the board. Mostly new to SUPs, they all commented on the excellent stability provided by the Fanatic Falcon Air 12' 6" board. The board showed great rigidity, surprising many that it was an inflatable board. Lots of fun was had by all. Inland SUPing is certainly a great way to see nature at its best. Being on the water is also a very cool option on the hots days experienced in Far North Queensland. We had a great time on our inflatable Fanatic SUP at Adels Grove. We picked it up in Mt Isa and travelled to Adels Grove with the Fanatic Falcon Air backpack on our roof cage with a swag and a few camp chairs. Once inflated (took about 5 minutes - easy work), we were able to duck down to the creek at any time for an explore and cool off. Great for this part of the world! We also took the Falcon Air (inflated) to nearby Lawn Hill NP to explore the magnificent gorges feed by the underground springs. This saved on canoe hire and gave us all a great chance to see the gorge at its best, up close. have you been to SUP board riding at Adels Grove? Explore SUP board riding at Adels Grove with RvTrips and find out where to stay, what to do and what to see. Helping caravan, motorhome and camper owners have a great holiday.